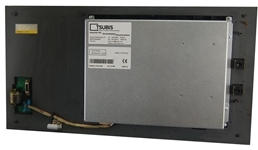 7,2" SHARP Display Panel for Fanuc A02B-0200-C084 . 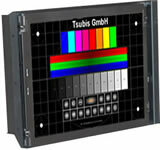 Tsubis GmbH offer TFT replacement monitors and LCD displays for several Fanuc control units. You replace older CRT monitor into new TFT monitor completely or just change LCD panels within your Fanuc unit. You can get replacement kit for your LCD units, as well. This serviceable kit includes open frame monitor, Fanuc controller and inverter. 12,1" LCD industrial monitor as replacement for CRT monitor. 10,4" LCD industrial monitor as replacement for CRT monitor. 8,4" LCD industrial monitor as replacement for CRT monitor. 8,4" TFT industrial monitor as replacement for plasma monitor. 8,4" TFT industrial monitor as replacement for CRT monitor. 10,5" TFT display for Fanuc control LCD units. The Fanuc cnc unit series Fanuc 16 TT. 9" TFT display for Fanuc control LCD units. The Fanuc cnc unit series Fanuc 0-MD, 0-TD. 10,4" TFT display for Fanuc control LCD units. The Fanuc cnc unit series Fanuc 15-B, 16, 18, 20. 9,5" TFT display for Fanuc control LCD units. The Fanuc cnc unit series Fanuc 16L. 8,4" TFT display for Fanuc control LCD units. The Fanuc cnc unit series. 7,2" TFT display for Fanuc control LCD units. The Fanuc cnc unit series 0-MD, Fanuc 0-TD, 0-Mate, 0i-Mate, Power Mate D, Fanuc 16, 18. 9,5" TFT display for Fanuc control LCD units. The Fanuc cnc unit series Fanuc 15-B, 16-C, 18-C.
9,5" TFT display for Fanuc control LCD units. The Fanuc cnc unit series Fanuc 15-B, 16-C, 18-C..
10,4" TFT display for Fanuc control LCD units. 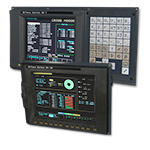 The Fanuc cnc unit series 16, 18i et 21i..
10,4" TFT display for Fanuc control LCD units. The Fanuc cnc unit series Oi, Oi-Mate model B and Fanuc 16i, 18i, 20i, 21i, 160i. 9" TFT display for Fanuc control LCD units. The Fanuc cnc unit series Oi, Oi-Mate model B and Fanuc 16i, 18i, 20i, 21i, 160i. 12,1" TFT display for Fanuc control LCD units. The Fanuc cnc unit series. 8,4" TFT display for Fanuc control LCD units. The Fanuc cnc unit series Fanuc 15M, 15T, 15i, 16M, 16T, 16i, 18M, 18T. 15,1" TFT display for Fanuc control LCD units. The Fanuc cnc unit series. 4,7" TFT display for Fanuc control LCD units. The Fanuc cnc unit series. 12,1" TFT display for Fanuc control LCD units. The Fanuc cnc unit series Fanuc i. This 10,4" TFT industrial monitor is a replacement for the 9,5" TFT monitor of the Fanuc unit. 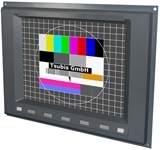 This 10,4" TFT industrial monitor is a replacement for the 9,4" TFT monitor of the Fanuc unit. This 10,4" TFT industrial monitor is a replacement for the 10,4" TFT monitor of the Fanuc unit. 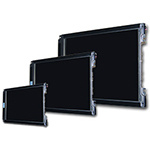 This 8,4" TFT industrial monitor is a replacement for the 8,4" TFT monitor of the Fanuc unit.